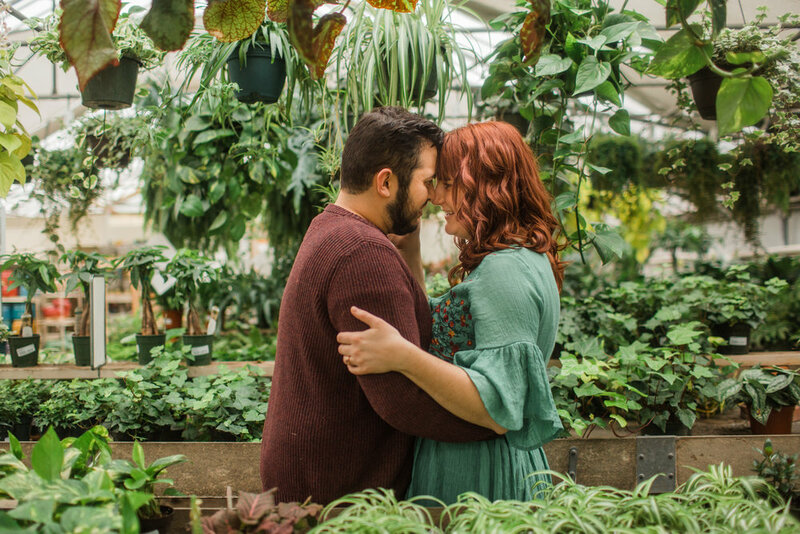 We had to reschedule engagement photos since I came down with a 24-hour bug in January. Probably for the better since I’m pretty sure the high was like 5 degrees that day. Thanks Iowa. We photographed these the weekend after the polar vortex wrecked Des Moines… and the high was like 40! Winter in Iowa is such a weird thing. We knew Morganne liked Bobby when she invited some of us girls to a bar in Ames “for drinks” aka to watch Bobby and his band play. LOLOLOL. She pretty much avoided eye contact with him the ENTIRE time. So hilarious to look back on! I think I met Bobby in June just after they started dating. (Actually, I came over right after a photo shoot in Ames!) I left that conversation pretty sure that this was “the one” for Morganne. And when she causally dropped that she loved him this fall, I freaked out a little (read: a LOT) and we knew we knew we knew. Then he proposed at Burgie’s Coffee shop in Ames, but y’all figured that out already. 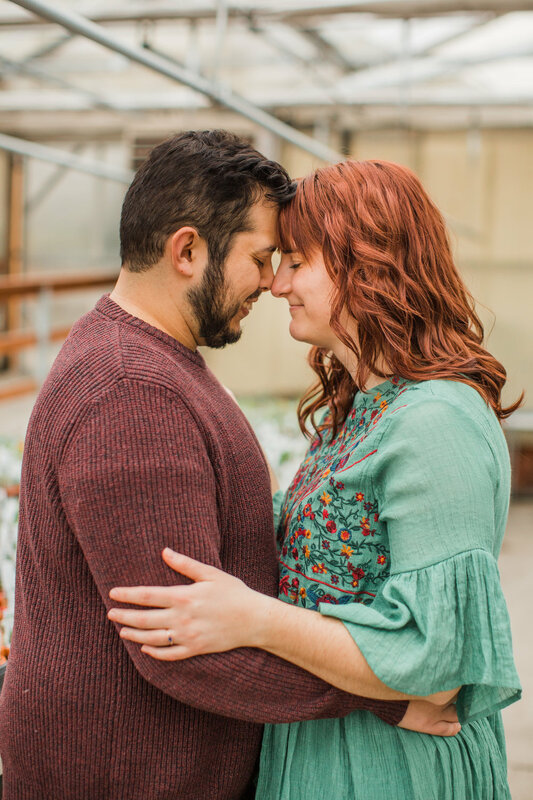 We started wrapping up their engagement session downtown in Des Moines. 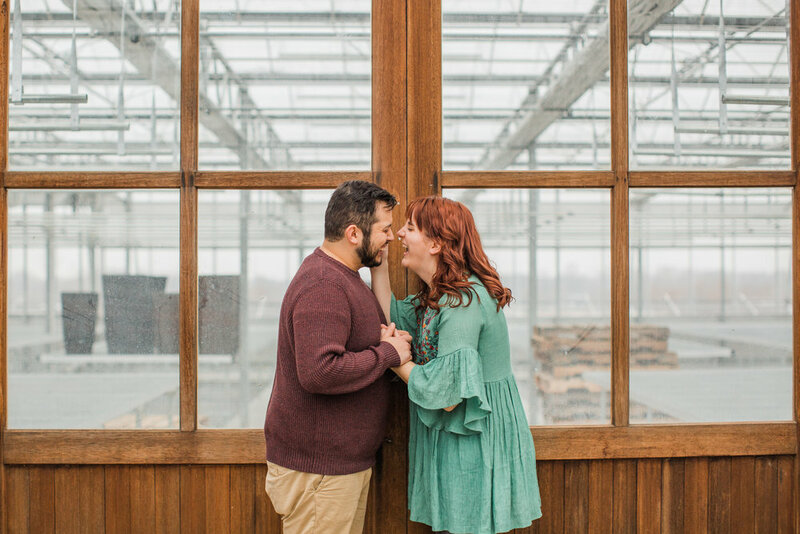 Bobby decided at the beginning of our time together that his goal for their session was to make it hipster soooo we tried to hit up a lot of the photo cliche’s in Des Moines. (Greenhouse, WaterWorks park, and Downtown!) Just call me a #hipsterphotographer I guess?? But we found the most instagrammed mural downtown —not a bad spot. My favorite might be the last one… fog set in hard, and we snuck inside the ground floor of a parking garage by the river to soak up some moody feels. Ya thought we were done?! Not quite, friends! 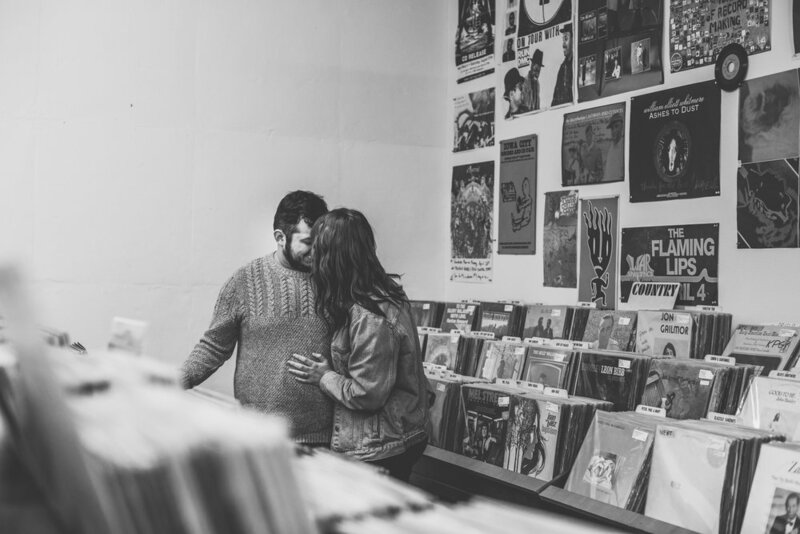 These two had a last request— to stop at Zzz, the local record shop. Bobby is a music enthusiast, and his one final request was a few (quick!) photos of them inside the store.